Last night while rustling around my fridge to find something to marinate sea bass, I found kaffir lime leaves. The rest is history. 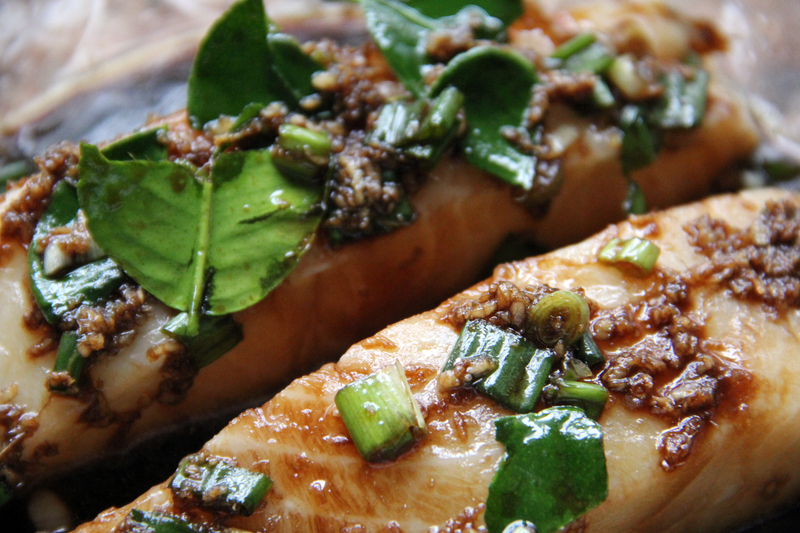 Kaffir lime leaves are often used in Thai cooking and provide a wonderfully fragrant bite. The taste is so amazingly fresh and delicious. I often find them in the fresh herb section of my grocery store. 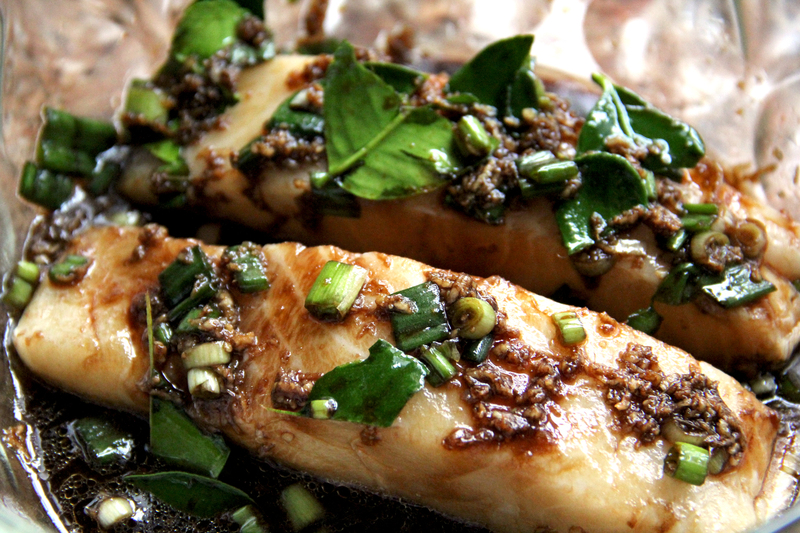 This marinade is a good starting point for any asian style marinade. I’ve made it countless times with variation depending on what I have in my fridge and pantry. 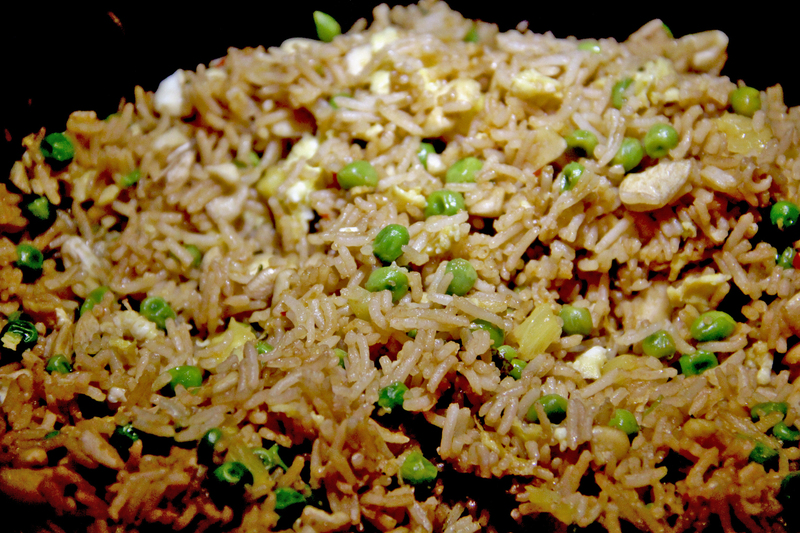 Sometimes it incorporates fresh lime juice, honey, red pepper flakes or even lemongrass paste. It changes every time. As I mentioned, I had two beautiful sea bass filets ready and waiting for something liven them up. Mixed with garlic, ginger, sesame oil and the other ingredients listed below, it’s all a match made in heaven. Mix all ingredients in a medium-sized bowl. In my case I added sea bass, but you could add shrimp, chicken, beef or even tofu depending on your liking. Be sure to coat everything with the marinade and either leave in a bowl, spooning marinade over periodically or throw into a freezer bag and turn several times. I marinated my fish for a few hours and baked for 15 minutes or so in a 475 degree oven until the insides ran clear and were nice and white. You could saute in a pan, grill on skewers or broil depending on what your prefer. 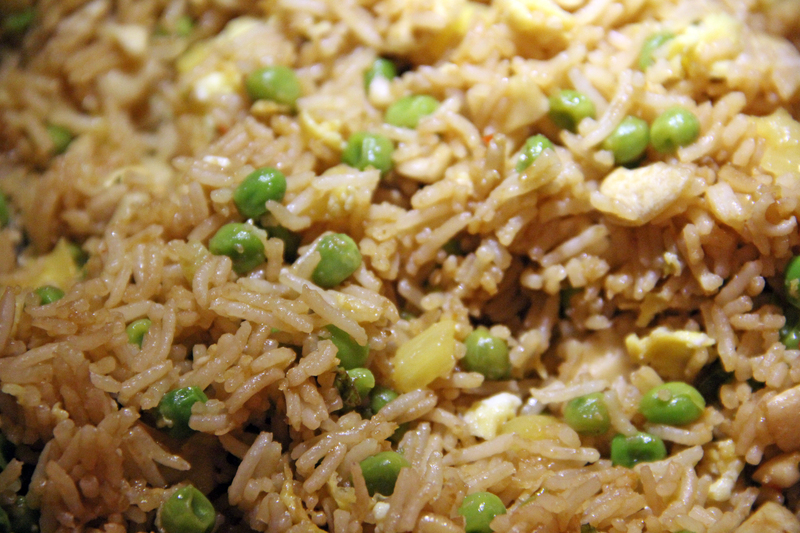 I served it up with my tasty pineapple cashew rice – a mix of jasmine rice, sesame oil, soy sauce, onion, garlic, ginger, peas, fresh pineapple chunks, scrambled egg and cashews. And I can’t forget my asian green beans sauteed in garlic, sesame oil, grapeseed oil, ginger and sesame seeds. The flavor combination of all three dishes went perfectly together. 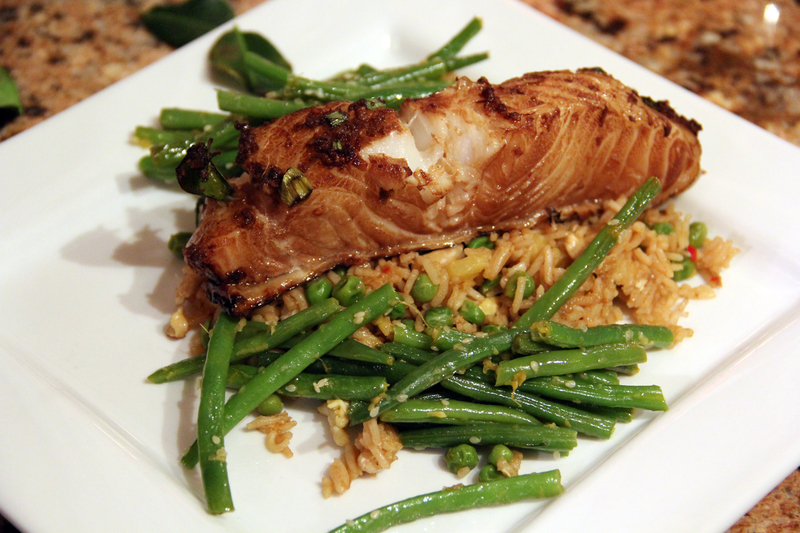 The sea bass was flaky, buttery and fragrant. 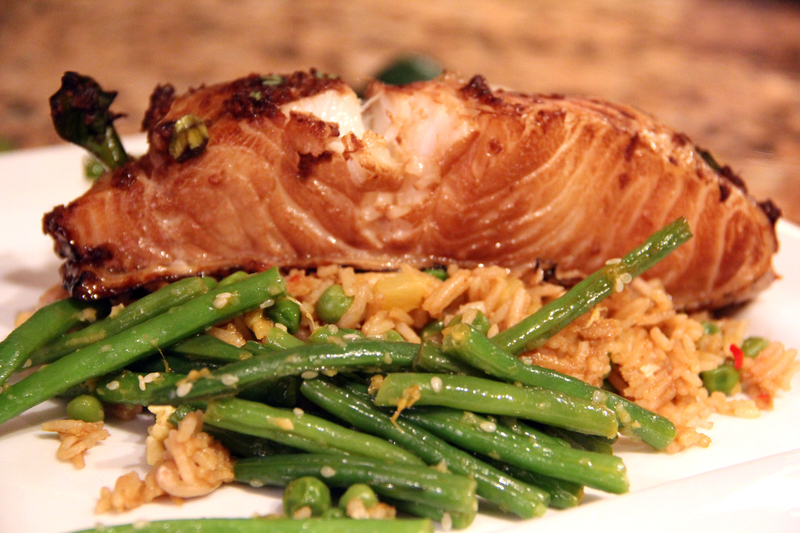 The rice was sweet and salty, and the beans added a perfect crunch to an all-together delicious tasting dinner. If you haven’t experimented with kaffir lime leaves I urge you to pick some up the next time you are at the store. There really is no substitute for their bright, floral taste. Like a regular lime on steroids. Amazing! Enjoy. Please note, the leaves are not meant to be eaten, only as a flavoring device.